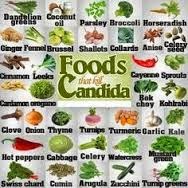 A candida diet can help halt yeast from overgrowing in our body. When candida starts to multiply out of control it can bring about a plethora of different symptoms, including fatigue, rashes, headaches and depression. One of the main ways yeast grows is by feeding on the sugar we consume in our diet. Therefore to get rid of any excess yeast in our system one should try and avoid foods with either sugar or yeast in the ingredients. Generally when following a yeast free diet one should follow a certain set of guidelines as far as what foods and liquids they ingest. For instance drinking 8 glasses of water every day can help move along the detoxification process. One should also avoid fresh fruits for at least the initial detox as they contain sugar which helps feed the yeast and keep them alive. However after a few weeks when the yeast has begun to die off one should reintroduce such fruits as raspberries and blueberries which have health benefits while continuing to avoid such items as grapes or any fruit that has been bruised. When deciding on dairy products one needs to be careful what they choose. Any hard cheeses with rinds should be avoided as they contain yeast. Cheeses that aren't moldy or fermented and are fresher like mozzarella or goat cheese are allowed in moderation. Now as warning when the yeast begins to die off in your system you may actually begin to feel worse than you did initially. Don't panic! This is completely normal. When yeast begins to die they release toxins into your bloodstream. Within a week or so all these toxins will be flushed out of your system and you'll feel better than you have in ages. Some practitioners claim that peppermint teas and chamomile teas can help during this brief worsening in conditions by aiding in digestion and migraine relief. Some of the symptoms often reported during this phase are bloating, gas, itchiness, nausea, excessive sweating and other flu like conditions. If this happens to you then it just goes to show how many toxins were lingering in your system that needed to be purged. A question I always get is "What if I cheat on my diet?" My response is always the same. "Almost everyone cheats at some point!If you happen to stumble and fall off your diet then pick yourself up and forge ahead. Some dieters that cheat can immediately feel the results of their cheating. They often times report having headaches, upset stomachs or basically just an overall sense of feeling poorly. If you fall into this category try to drink one of the teas mentioned above and avoid any further sugar or yeast intake. That's all for now! Good luck on your new no yeast diet!